Former Nigerian international Michael Emenalo has labelled as false, reports linking him with a possible sack at Chelsea following emerging rumours of his replacement in Walter Sabatini. Emenalo’s position at the club’s Football Director was reportedly under threat after former Roma sporting director Sabatini was said to have held talks with the Blues’ hierarchy with new manager Antonio Conte believed to mastermind Emenalo’s displacement. The 51-year old football administrator has reacted to the rumour, taking to twitter to clear the air on what has been reported in the media while also insisting on the club’s board target of getting the club back to where it belongs. “Reports about me leaving Chelsea are false. The board is working very hard to get the club back to where we belong. In the Championship,” Emenalo tweeted. The Nigerian whose responsibilities included heading the scouting and academy programs had in 2013 formally requested that his contract be terminated to facilitate the return of José Mourinho -a request that was reportedly denied by Chelsea owner Roman Abramovic. 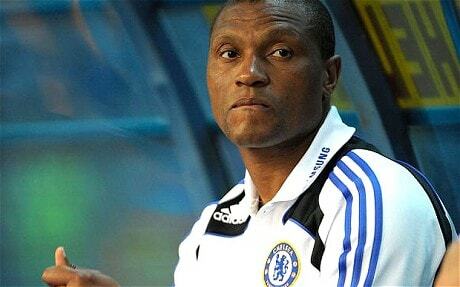 Emenalo joined Chelsea when former manager Avram Grant took in charge in 2007. After the departure of Ray Wilkins, the fomer Maccabi Tel Aviv star who has 14 caps for Nigeria was promoted from his position as chief scout to assistant first team coach in 2010 and was named Chelsea’s Technical Director eight months later.